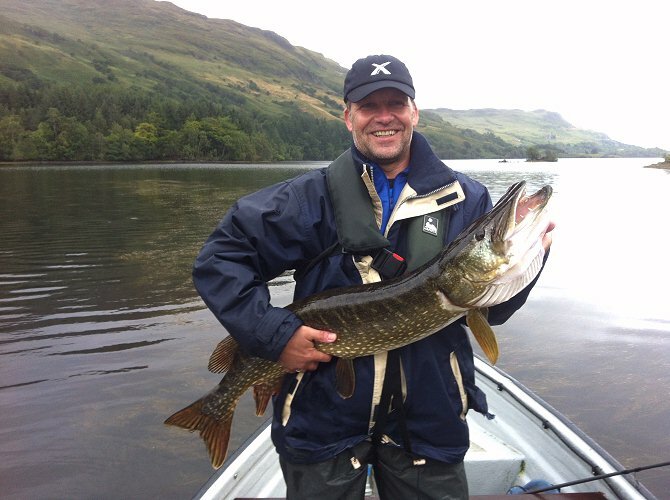 fish on some of the most prolific pike fishing venues in Scotland. We provide 1 day guided pike fishing trips and 2 to 6 day guided pike fishing holidays with professional pike fishing guides, boat hire and all tackle provided. All the lochs we fish are surrounded by spectacular scenery and wildlife and yet only an hours drive from Edinburgh. 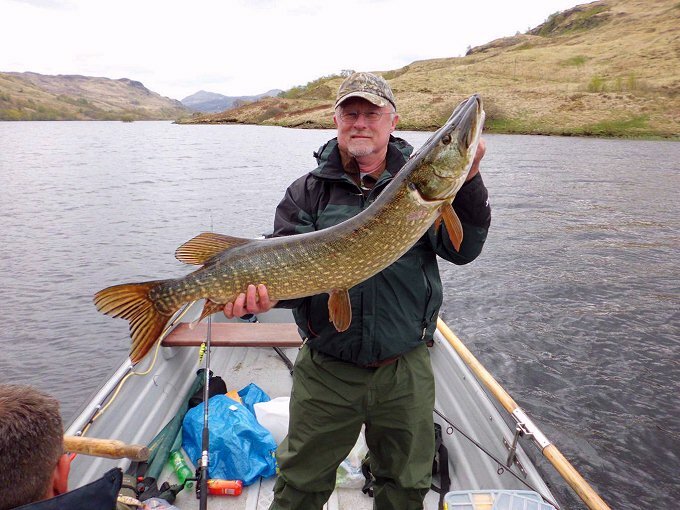 Our pike fishing guides have a wealth of experience in fishing for double figure preditory pike, which has been built up over many years of pike fishing in Scotland. They know the best lures, baits and flies to use and the best fishing hot spots which are likely to produce great sport at most times of the year. You can choose from bank fishing or boat fishing on one of our dedicated pike fishing boats. Fishing by boat give us access to all of the best pike fishing areas on the loch, most of which can't be reached by bank fishing alone. We typically source locally supplied dead baits and also use a wide selection of very effective pike fishing plugs and lures. We can also offer fly fishing for pike which is one of our specialities. Playing a double figure pike on a fly rod & light line is something any fisherman needs to experience at least once, but be warned this may change the way for fish for big pike in the future. The lochs that we fish are considerably smaller than some of the larger bodies of water such as Loch Awe or Loch Lomond and provide far better oportunities of hooking into a 20lb plus pike without having to spend a great deal of time travelling between hot spots. Loch Venachar for example is only four miles long with the Menteith Hills on the southern shore providing numerous feeder burns which run through the forestry and natural woodlands. Loch Achray is a much smaller loch and because it is well sheltered by the surrounding landscape, it provides an excellent venue for both spin fishing and fly fishing for pike. 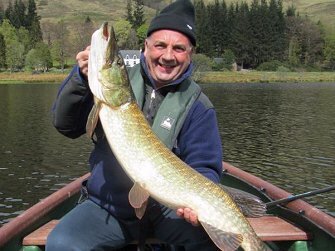 All of the lochs that we fish hold an excellent head of pristine, double figure pike and Loch Venachar produced a 35lb 7oz monster in August 2011. We can't guarantee that you will catch something this big but we can guarantee, we will put you in the right spot with the right tackle and the rest is up to the pike. Scotland is world famous for its Atlantic salmon fishing and Whisky distillaries but one of Scotland's best kept secrets is that it is one of the best countries in Europe to fish for pristine, monster pike. Experience a day or several days fishing for monster pike surrounded by the spectacular scenery and wildlife of the Trossachs National Park in Scotland. If you have never fished for pike before, our highly experienced guides will teach you the different methods of pike fishing including bait fishing, spinning with lures or even fly fishing. 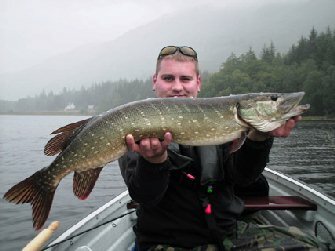 We can also arrange 3 and 6 day pike fishing trips where you will be taken to three different venues during your stay and given the opportunity of fishing some of the best pike fishing lochs in the Trossachs. Airport transfers from either Edinburgh or Glasgow Airports can be arranged for �85.00 each way and B&B accommodation in a local guest house or hotel for about �45.00 per night. We cater for individuals or groups from complete beginners to experienced anglers. If you are fishing with us for two or more days, there is an excellent selection of good, quality hotels and guest houses in the local area. The town of Callander would be an ideal location to base yourself, being central to all of the lochs that we fish and we can arrange to pick you up, from here each day. Our head guide will be more than happy to discuss a variety of local accommodation options with you. the same each day regardless of the number of days fished. We do have boats that will hold 3 anglers but in accordance with the permits only two anglers can fish at any one time. Please let us know if you prefer a single boat for 3 people. If you wish to check availability we will need to know your preferred dates. We choose our venues very carefully and prefer to take our clients to the more select and pristine lochs rather than the heavily fished coarse fisheries which hold large populations of bottom feeding carp and other non native species which can seriously effect the clarity of the water and quality of the fishing. The quality of fish we catch is also very important to us and we don't want our clients to catch damaged and poorly treated pike which are caught by mistake on the wrong tackle or just badly handled by less concerning anglers. We only fish the best quality of pike fishing waters in Scotland which hold some of the biggest, pristine and hard fighting pike that you are likely to catch with a rod a line in Scotland.